While shopping at Pike Place Market in Seattle we picked up lots of fresh veggies and cooked all week for the family. I thought I would share with you one of the salads I fixed this week. It was just a throw together with items readily available, it tasted great and looked beautiful too. Kenny will like this one for sure. Tear or cut the beet tops from the beets, leaving about an inch of stalk attached. Wash and thoroughly dry the beets. Place beets in a roasting pan or on a flat baking pan or sheet pan. Drizzle with a bit of extra virgin olive oil and sprinkle with Kosher salt. Roast for 30-45 minutes, depending on size. Test for doneness after about 30 minutes of cooking by piercing the largest beet with a knife. If the knife easily enters the beet with only a small amount of resistance, it’s done. And the smaller ones will be, too. Remove from oven and let cool for 20 minutes or so. Slip the skins off the beets by hand, they should slip off easily. Cut the beets into ½-inch slices and toss in a stainless steel mixing bowl with enough olive oil to coat them. Cut the lemon in half and squeeze the juice of about half of it in to the bowl, gently stirring to combine and checking the flavor as you go. Season to taste with Kosher salt. Whisk together 3 Tbsp olive oil and 1 Tbsp lemon juice and toss the greens in this dressing in a separate bowl. 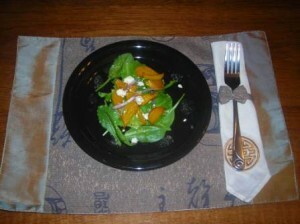 Place greens on salad plate, spoon on beet mixture add a few slivers of purple onion and feta cheese, serve right a way.